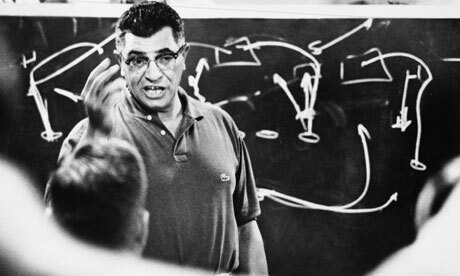 Vince Lombardi Head Coach of the Green Bay Packers in the 1960s and one of the great thinkers in sports history had a plethora of quotable adages about team work, sporting excellence, motivation and the qualities in life that count for so much: almost embodying what team sport is all about. Commitment as a group is key, particularly when there are forces massed against you. Enemies from without is to be expected so Alan Hansen's negativity on MOTD is par for the course particularly given his past status with Liverpool FC (haunted by ghosts of '89 perhaps?). Personally I record or pause MOTD on Sky+ and FF through the inane punditry as I do the commercials, so rarely pay heed to such nonsense. What did make me pause for thought was an interview on ArsenalFanTV with a rather negative Arsenal supporter following our 0-2 success at Palace. Now I'm not one for name calling of fellow supporters and I do think that we all have opinions that we are entitled to but, and it's a big but, this chap seemed to show no comprehension of the realities of the Premier League in 2013. I think that making comparisons with the Henry, Vieira,Pires, Ljungberg, Bergkamp team only gets you so far, as does plucking names of players you want to join the club out of thin air (yeah, let's have Ronaldo, Messi and Maradona). We won. Yes we won a game in a Premier League that is an arduous journey rife with banana skins and the accumulation of points is everything. Good teams aspire to play the beautiful game to achieve success but good teams are also prepared to win ugly. Our away support is, and has always been, magnificent and I don't believe this fellow is indicative of Arsenal supporters en masse. What he represents is hard to say but his views certainly pushed a lot of people's buttons. To my way of thinking the reaction to his interview is due to the lack of individual commitment to a group cause. At this time in Arsenal's history unity is vital. The team look unified and yesterday showed a resilience that, so far this season characterises why we have been so successful. There is also a unity among the support which promotes that elusive feel good factor. Guys like this chip away at that and unlike Hansen, you expect fair and reasonable comment and yes, criticism, not out and out sour derision. There was no discussion, no rational argument just invictive and I think the interviewer kept his cool where others may have acted differently. Anyone who has read arsenalism before will know I do not opt for the 'everything's great/everything's terrible' approach but I would like to believe that pausing for reflection would bring context to any result and a victory to retain top spot in the league following a loss in the previous game to one of the best teams in Europe would be something to crack a smile over...at minimum. Enemies from without are par for the course, particularly as, for a Northern centric football media we represent the suave urbane Londoner stereotype, but we can do without enemies within; particularly those who will not enter into a debate. Debate may have led to the realisation that the win at palace could be three points that have genuine meaning come the end of the season. Commitment to the cause from all can reap rewards, and commitment is hard for supporters; freely chosen but hard, and maybe this time a reward will be reaped that is tangible. Vince Lombardi embued this philosophy with his teams and the support alike and through unity of purpose a philosophy came out on top.